I haven’t reviewed this whisky, but have enjoyed it for many years. As we have the new release of Talisker Skye, I thought it hide time I review this and side by side it with the new expression. Lighter than Skye, so I would assume less colouring. Quite different compared to Skye, more intense on the spicy smoke. More oak. BBQ glazed mackerel. In your backyard bonfire. Cracked black pepper. Salty sea air. Much more maritime and reminiscent of a seaside fishing village. Less sweet than Skye and more intrinsically complex and sniffable. We have light citrus, some apples in the background, some berries in the background. The fruit is very much hidden away amongst the bonfire. Medium length, sweet and drying, crisp. Salt. Brine. Chocolate, berries, ripe apples, pears, some oak. A little more BBQ, complex and enjoyable. More rewarding and feelgood. A few drops added. I don’t know if it’s my eyes or the lighting, but it looks like a little haze in my glass?! The nose is still Talisker through and through with some added floral. The smoke is slightly diminished, but still lots of maritime fun to be had. The palate, is sweeter, but development still comes layers of fruit, dark fruits, smoke, oak, salt, BBQ, lots of complexity. The finish is sweeter, but still satisfying, warming, and all round Talisker. It’s Talisker. I named my cat Talisker for a reason, and this whisky is that reason. It’s awesome, tasty, complex, characterful, and has a really bushy tail. May have got confused there a bit. All except for the last thing. It’s a great whisky. There is no rumour of its demise in favour of the other expressions out there, but I may just stock up a few extra bottles…just in case. If I’ve said it once, I’ve said it several times. 46%. Non-chill filtered. No colouring. Please. Your as near as dammit to 46% anyway, surely obliterating the chill filtration would save you money in the production process anyway!!! Comparison. Skye vs. 10 year old. It comes down to the most simplistic question. Do you want complex or easy drinking? If you want easy go Skye! If you want to taste your whisky, feel your whisky, and take your time. Go for the 10 year old. My own bottle….more Talisker expressions to come. The new, controversial non-age statement expression from Talisker on the Isle of Skye. I’m reviewing this directly side by side with the Talisker 10 year old. Both from bottles opened only a few days ago. The first thing to notice that Skye is darker than the 10. However, as the back suggests in German, we are in the added colouring zone. Colour is not as it seems. Other than I would suspect there is more in Skye. Softly, softly, sweeter Talisker. More fruit and less smokey spice. Ripe Apple, pears, something candied orange peel like. Light pepper, light smoked mackerel. Bonfire smoke from a good distance. Sweet cinnamon. Pastry. Burnt brown sugar. Caramel. Treacle toffee. The smokiness is hidden behind the sweetness. It’s a simpler nose than the 10 year old. Sniffable, but sweetness heavy. Sweet arrival, with a little smokey peat hit, alongside the alcohol nip. Once subsided we have plenty of apples, pears, a touch of saltiness, sugar, caramel, toffee, some more fruit, then it kind of fades a little bit, and becomes sweet and watery with a little salty caramel, hint of chocolate. Short-medium length, some pepper, lots of sweet caramel/toffee. Touches of salt, BBQ sauce, some charred oak, with a touch of gooseberry. Leaves the mouth dry and needy, easy to drop back for another sip. A few drops added. There is more of a floral element up front, Parma violets. I would say the smoke is more prominent on the nose now, but the fruit is sidelined. Still sweet, and sugary, but in the floral sense. The palate is very sweet, sugared fruit, apples, pears, oranges, caramel, toffee, again fading out during the development. The finish, shorter, sweet, caramel, toffee, light fruit. One not to add water to as it lessens the experience. It’s not bad. It is essentially Talisker for the masses. It’s very approachable and easy going, and has elements of the Talisker 10 year old we know and love. It’s easy drinking. A whisky more about drinking than experiencing whisky. It comes down to the most simplistic question. Do you want complex or easy drinking? If you want easy, quaffable whisky then go Skye! If you want to taste your whisky, feel your whisky, take your time and savour. Go for the 10 year old. 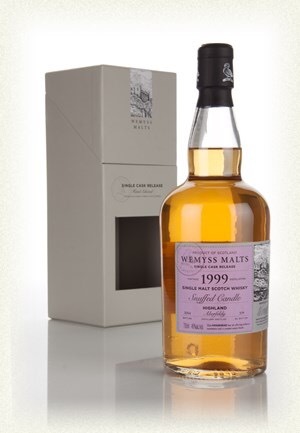 One of the latest outturn of Wemyss’ single cask releases. The complete list of single malts include cask strength Kirsch Gateau 1988 single cask from Bunnahabhain Distillery, Islay; Cacoa Geyser 1998 single cask from Bowmore Distillery, Islay; Snuffed Candle 1999 single cask from Aberfeldy Distillery, Highlands; Dark Treacle Fondant 2002 single cask Craigellachie Distillery, Speyside; Honeysuckle Bower 1995 single cask from Linkwood Distillery, Speyside; and Carribean Crème 1988 single cask from Invergordon Distillery. Oily and slightly lactic. Vegetal peat. Light medicinal smoke. Struck match. Some berries. Dried cranberries and raisins. Some dried orange. Touches of dusty cocoa powder. Some cinnamon. It’s a challenging nose, quite different from the usual sherried Bowmore’s of similar age. Big and fruity. Not a lot of smoke evident. Spicy, tongue tingling arrival, moving into the development, with chilli and clove. Fruit comes back during the development, quite the blackcurrant purée, with some prunes, raisins and some dried fruits mixed in. Some dark chocolate is in the mix here. Almost Cadbury fruit and nut bar, but low on the nuts. And there’s some smoke. The smoke is in the finish, along with the blackcurrants, and mixed dried fruits on the palate. Has some aggression on the throat, which I think will be calmed with a little water. Adding a splash. The nose has touches of nuttiness now amongst the previous experience. The palate has more smoke in the development, some charred oak, oils, ash and even a little coal. Slightly less fruity now, some added barley sugar, but more of an Islay character overall. 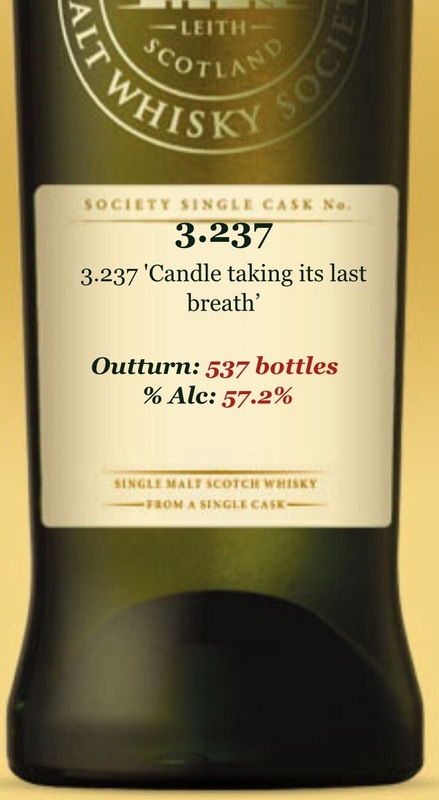 The finish is fruity and chocolatey, with whiffs of medicinal peat smoke and some maritime characteristics. I think this is one to add a drop of water to to give it some additional complexities. A nice confectionary style big dram, lots of intense flavour. With water it turns into a more maritime and transitional Islay dram with a twist. It’s very different to many sherried bowmore whiskies and as such it is more challenging an experience. Much thanks to Wemyss for providing me with a review sample. It’s sold out pretty much everywhere in the UK as far as I know, always the possibility of a purchase from overseas though. 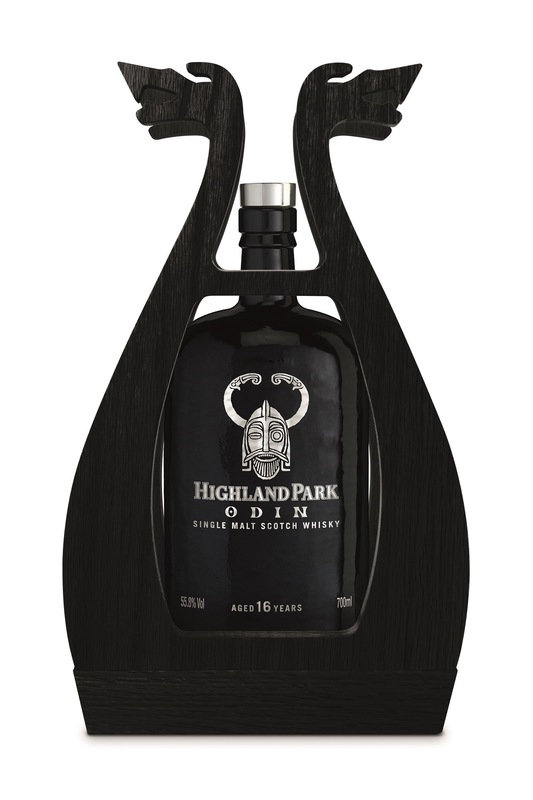 The final entry in Highland Park’s Valhalla range is upon us and it promises to be a monster of a dram. It’s the priciest entry at a retail price of £180.00. And as the previous entries have done more trading on the auction markets than have been opened and enjoyed, I would suspect nothing less from this one. I’m more about the whisky though, so I’m glad to have had the opportunity through bottle sharing to open one myself. The packaging has to be spoken of. The wooden frame, this time in black, looks great. And the bottle itself, a dark, shiny embossed black, with some metal enhancements showing the name, and the Odin moniker is fantastic, as is the shiny chrome topped cork. It’s collectible and will remain in the collection anyway as a statement to fantastic bottling at its best. But you know, it’s not all about the packaging. Let’s have a sip. A nutty, sweet sherry is first to come to mind. A touch of pleasant rubber (on the end of your pencil). Some pepper. Cinnamon. A smidge of clove. There is a little smoke, but it’s more of a burning oak, some pencil shavings smouldering. Fruitcake. Rum and raisin. There’s a nice full sensory roundness to the nose. It reeks of good quality. Some polished oak comes forward in time and more sherry notes, with less of the rubber. There are touches of evergreen now. Some richer fudge and rum truffle notes. Some light chocolate. Very relaxing and authoritative. The arrival is sweet sherry fruits, then a big bash of sweet spice, not alcohol heat so much but spicy flavour. Chilli. Pepper. Alcohol infused rich fruitcake, heavy on the cherries. The development goes into more fruitiness, with sherried dark fruits, cherries, cloves, spicy cinnamon, some sulphurous elements, but not in a nasty way, the light gunpowder compliments very well with the deep fruitiness very well. There is a feelgood factor hitting the development-finish of this dram, as I can only describe as a big smile involuntarily hitting my face! A few drops added to what I have left of my dram. Cherries are very upfront of the nose now. Loads of fruit in fact. Heavenly. Rum and raisin, fruitcake. Some menthol is now present also. Some dusty oak. The palate is juicier and fresher now, full of fruit and spice still, but more integrated throughout the arrival and development. The cherry notes are really prominent and hitting the back of the throat, like mentholated cherry throat sweets. The finish is sweeter and longer, with all of that fruit sticking around giving one almightily beautiful aftertaste. This is dangerously moreish for a drop of water, sipped til dry very quickly! Gorgeous stuff. Wow. Fantastic dram, very unique for a Highland Park. It has some massive flavours and big characteristics to explore, with water it becomes softer but bigger, less spice but tonnes of fruit. So very flavoursome and exciting. If you have bought a bottle and it wouldn’t hurt you to open it and enjoy it, then do so. You won’t be disappointed. This Is an awesome experience, and one you will be able to remember for years with the bottle and stand adorning your household even though the liquid is long devoured. Much thanks to Highland Park for providing me with a review sample. 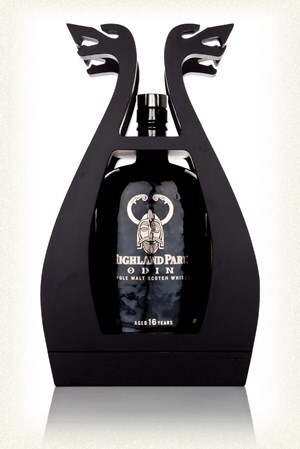 Odin will be available from specialist independent whisky retailers, at the Highland Park distillery and http://www.highlandpark.co.uk at an RRP of £180. ~£89.00 where you can find it. Waxy orange pith. Lots of vanilla. Cinnamon. Winter spices. Apple. Candied fruits. The name of the whisky is very apt, because it is very much reminding me of a scented candle. There is also a touch of smoke and wood char which would go with the snuffed element of that name! Time in the glass releases more fruits, pineapple cubes, touches of cola, a little more pepper, wax polish and some delicate oak. Sweet, waxy arrival, tropical fruits, pineapple, mango, apple, some candied orange peel. The development gives a little pepper spice bite, evolving into more fruit layers with some spicy interactions, more orange, vanilla, a touch of clove all the time very waxy and fulfilling in the mouthfeel. There is a smoky element to the development, wood smoke and charred oak. The fruit and spices stick around for a medium length finish, drying out slowly with touches of oak char at the very end. Only a few drops added as this is very drinkable at the bottled strength. Wow. The water has unleashed extra fruity layering. The fruits are far more vibrant now, with the dried and sugared pineapple chunks taking centre stage, wax, orange, apple, pears are also amongst the mix. Lots of sugar. Pepper. Sweet liquorice. Sweet cinnamon, almost Cinnabun cream. Vanilla cream. Bloody lovely. The palate reflects this, fruit juices exploding in the mouth, with some spicy backing making the whole event bigger. The development has some drier elements now, and the finish is slightly drier, and it works very well. Definitely a dram to add a few drops to. Fruity, juicy, with some complex spicy waxy candied fruit, I would say aged very well, feeling older than its actual years. Very tasty, easy drinker which I could happily sip all night long. Vanilla and coconut cream! Coconut flesh, milk, shell. The whole thing. Buttery popcorn, which gets richer the more air that the dram gets. Lots of custard. Some pepper and nutmeg. Quite the egg custard tart going on. Including some fresh shortcrust pastry. Lots of fresh pastries. Sugary marshmallow, reminds me of snowball cakes. Some light milk, borderline white chocolate. Touches of oak dust. But all about the sweet confectionary. Sweet sweet sweet arrival. Lots of sweetcorn, vanilla, sweet desiccated coconut. Chocolate, marshmallow, buttered popcorn. The development continues this thick creamy theme, layers of buttery creamy vanilla, custard and pastry goodness comes forth, a lovely viscous mouthfeel accompanying this. Some memories of Krispy Kreme coconut cream donuts. With some nutmeg, sweet cinnamon and pepper spices combined. Lovely. Very long. Continuing the theme. Sweet. Lots of coconut cream, vanilla, sweet, peppery spices and chocolate. This is confectionary paradise. A lovely gentle chest warming shows the age through and gives a feelgood factor and a grin! Only a couple drops. Conscious of age and the fact I’m loving it as it is! Things are more saccharine sweet. The nose has a touch more dusty spice with an increase in the coconut intensity. The palate also has more of a coconut intensity to it, with some of the more subtle complexities simplified into the coconut forefront. The finish again, sweeter, slightly shorter with more of a meringue note. Personally I feel water lessens the complexities and I would not dilute this one. A lovely example of an older grain whisky. Showing that grain whisky can be great when properly matured. I love the confectionary sweetness, I would say it is one of the sweetest whiskies I have tried, and I have a sweet tooth! So it’s right up my alley! Immediately maritime with buckets of barbecue. Meaty, sticky ribs, pork smothered in BBQ sauce. The smoke is barbecue/bonfire variety, no tcp here. Chinese style sauced ribs. Hints of salty, smoked mackerel. Dark fruits. Stewed banana. Loads of dark burnt toffee. Caramel. Light on the spices. Some pepper and clove, Chinese 5 spice. All the time this isn’t overpowering in ABV on the nose. It’s very deeply sniffable. With time in the glass there are more dark fruits, raisin, fruitcake. More of the sherry cask influence comes forward given some time. Full full flavoured. Thick oily mouthfeel. Arrival is sweet and sticky with some salt, a little nip from the high alcohol, then wave and wave of barbecue meats, smoked meats, bonfire, toffee, bitter chocolate, some strong coffee giving the development a slight bitterness which is offset with the other flavours very nicely. Beautifully complex and delicious. Sweet going dry over a long time. With chocolate toffee, coffee, dark fruits, meaty bbq’d products and all round sticky lushness. You know, this is going down very well without water, but I need to add a bit to see what happens. The nose has more sweetness and sherried notes. Fruitcake, lots of it. Rum and raisin. The BBQ notes have been calmed, salted mackerel still remains. Some added spices. The palate reflects this move to sherry, lots of thick fruits, Christmas cake and spices. Toffee, chocolate. Spicy, tasty and moreish. The finish has more spice, less sticky in intensity, but still sweet with chocolate and some coffee elements, there is also some added fruit sweeties, banana foams, chewits. Yummy. Fantastic stuff. Single cask sherry Bowmore’s in the mid-late teens are a big weakness of mine, and this one is no exception. It’s gorgeous. Loads of flavour, goes on for ages. A perfect winter dram to drive out the cold. Affordable luxury. £40.50 available from Whisky Galore at the Green Welly Stop. 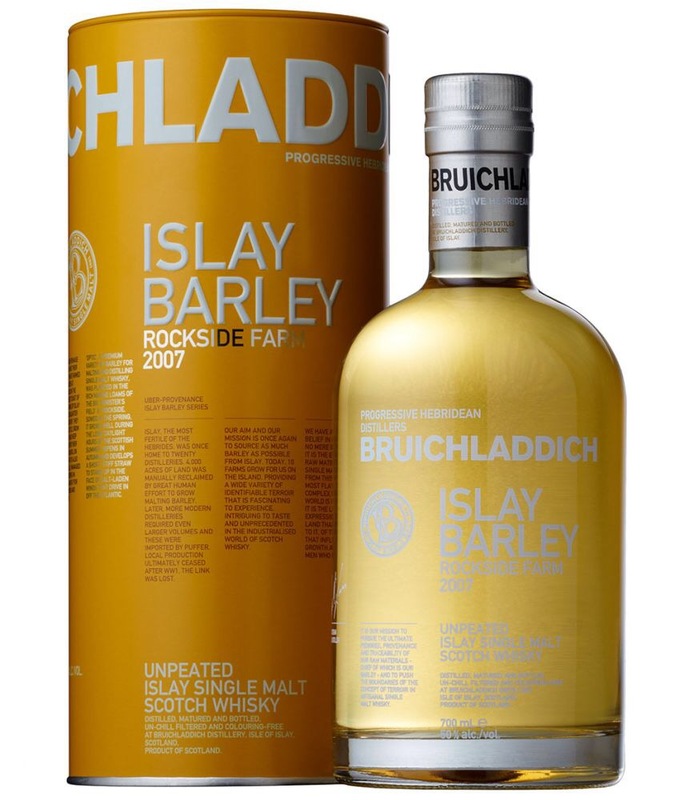 The latest release of Islay Barley from Bruichladdich. The barley in question being produced on Rockside farm. Harvested and distilled from in 2007, this 5-6 year old whisky has been very interesting in the past. Let’s see how this year favours. Lots of lovely creamy barley. Soaking in lemon juice. A pinch of pepper. Light vanilla. Porridge. Malt biscuits. This nose is all about the barley and citrus. In the background there are hints of grass, hay and dunnage warehouse. There is a very nice organic sense in the background, farm like. The arrival is sweet and sour complex. Lemons taking the front. Some pepper and chilli spice. After the heat of the 50% alcohol subsides, the development goes into creamy vanilla custard, lemon drizzle cake, rich barley oils. Oils is a very prominent feature of this palate, the mouthfeel is thick, extremely coating, gorgeous stuff. There is a touch of herbal as well, I’m not too great on picking up herbs, but there is something parsley like in the palate. Really complex. Delicious. Those wonderful oils spread the complex barley, cake like, citrus notes. Continuing for a fair duration (medium-long) considering the age. The after heat is well down into the chest, warming and not harsh. Very smooth. Moreish as well. This is so drinkable at bottled strength I don’t want to add water, but I will for experience sake! Just a few drops. The nose is more complex now, lots more herbal elements coming forward. Herbal lozenges, sage, clove. The citrus notes have dulled, but they are still in the background. The palate reflects the nose, very complex. Some fennel and aniseed flavours are intermingling with the citrus now. The mouthfeel still very oily. The finish has now an engine oil and barley rich note, more herbal again, but still retaining the citrus rich profile if the undiluted. To have water or not? Well, I like it either way to be honest. Half a dram without, then add a bit. Makes for a fun dram experience. This is fantastic stuff. I can’t remember the 2006 being as good as this one, don’t get me wrong that was awesome as well, but for me this 2007 Islay Barley is striking all the right notes. It’s light enough to be a breakfast whisky, but also complex enough to spend a lot of time considering its flavours over a long evening. 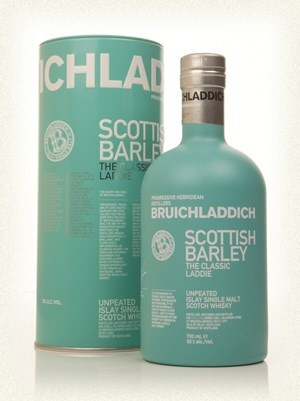 There are a nice selection of wee Laddies (small bottles) available now from various retailers which include the Laddie Classic, Islay Barley and the Botonist (Bruichladdich’s gin), if you don’t know Bruichladdich yet, and fancy taking a taste test there is no better way to do this than with those 20cl bottles. £41.63 from Master of Malt. Back on familiar ground here with the Classic Laddie from Bruichladdich. I have reviewed this one before, but it’s sometimes nice to go back to the same whisky, new bottling/batch and see how the whisky, or even, my tastebuds vary from year to year. Considering its unpeated, there is a whiff of peat smoke. This has been described due to the water source being used containing a fair amount of peat. It’s a very barley rich nose, creamy and thick. Vanilla. Soft fruits, melon, apricot, boiled pears. Some citrus. Touches of pepper. Spicy arrival, soon subsiding with the development moving to boiled fruit sweets. Fruit jelly. Melons, pears, apples, tropical fruits. Vanilla cream. The mouthfeel is sublime, thick with oils transporting the flavour around the mouth. I’m told this is due to Beuichladdich’s slow distillation techniques. The development goes on into malty barley notes, very rich and delectable. Long, oily, loads of barley and the soft fruits stick around as well. Lip smacking stuff. Only a small drop added as it is so very flavoursome at the bottled 50%. The nose is now exploding with fruit, which is very much intensified. More apples now, pear, melon, soft exotic fruitiness. Lush. Inthe nose still has some peat, some added leafy herbal notes, and a touch more pepper. 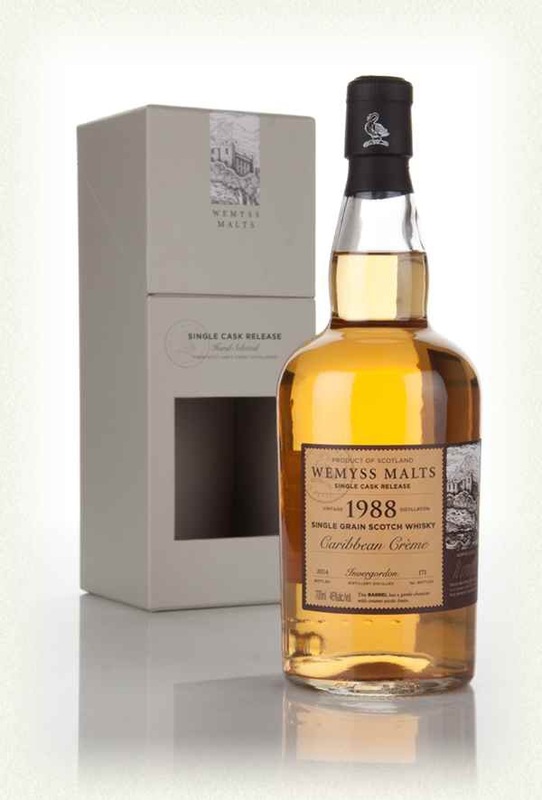 The palate is immediately more flavoursome with the fruits taking a more front line in the development, with some added spice, the mouth feel is amazing, and this is a really mouthwatering dram. The finish is still long, a touch more herbaceous, with some drying oak and sweet liquorice ending things off nicely. A gorgeous dram. I still compare this to the Laddie 10, which I do miss. But this is a very well constructed, tasty and truly unique dram from a unique distillery. I’ll make no omissions. I love Bruichladdich and what they do. I can’t wait to go back and visit again (May hopefully), and every sip is just heavenly for me.